This post may very well look inspired by the oh so perfect Instagrammers with their amazing bedrooms, but I won't lie and say it's not partially influenced and... OMG I want a room like that. Of course, mine will be white based walls with a silhouette mural or even a quote if I find one inspiring enough... But filled with bright colours and florals here there and everywhere. 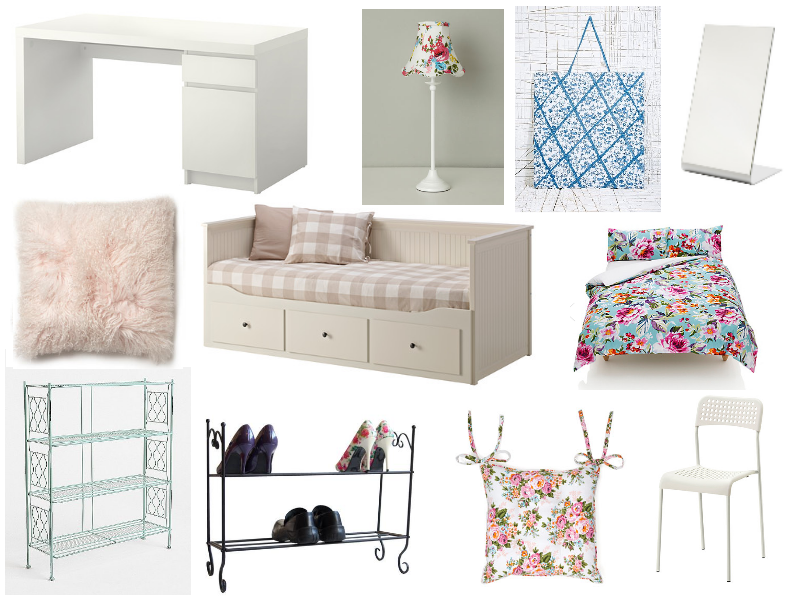 Now this wishlist of new things for my bedroom is because in a few months I will be getting a room to myself finally after years of sharing! My parent's are doing a huge extension and modifications to the house, and this results in Cat's dream bedroom becoming an almost reality. I'm pretty close to drawing up what I want my room to look like so I can see it, and then what I will draw on the wall... But as you can see I've already basically picked out the key things I'll need in my room, from bed, to storage, work space, sitting space and light features. I already have a wardrobe ready for me, but I'm also playing with the idea of not stealing my brother's huge wardrobe and buying myself a custom PAX wardrobe from IKEA. Ohhhh, that would be ideal if I had all the money. Also if you know of any pinterest boards which are great for inspiration, link me up with them! I'd love to take a look if it's yours! That lamp is amazing and such a bargain. I'm definitely going to be placing an order this evening! I've just finished uni and when moving home I want a total bedroom change including white walls and florals everywhere too!